The mission of seat belt is to ensure that，during the events which could createinjuries，the occupants of the vehicle are kept in the correct position avoiding any impactagainst the interior parts. Wearing seat belts properly，is fundamental to your safety and the safety of yourpassenger. During a crash or emergency stop，seat belts can help keep you from beingthrown against the inside of the car, against your passenger, or out of the car. Of course, seat belts cannot completely protect you in every crash. But, in mostcases，they reduce your chance of serious injury. They can even save your life. That iswhy regulatory require you to wear seat belts. Seat belts are strong nylon straps that hold people in their seats during a collision.Lap belts extend across a person's lap. Shoulder belts extend over a person's shoulder andchest. These components are essentially standardized, because the same component is usedon different cars and by different car-manufacturers. Small differences can be onlygenerated by specific conditions for belts installation. The main traditional components areshown in Fig. 10. 1. The webbing is the component of the safety seat belts that has the mission ofphysically restraining the occupants on the seat. It consists of a fabric with structure,warp and weft, woven with techniques and materials in such a way as to provide highresistance to breakage and severe aging cycles. The webbing is also responsible for the so-called comfort of use, which is determinedby the perception of the user when the seat belt is worn. A webbing which is soft andsmooth with low transverse stiffness is usually perceived better in terms of comfort than awebbing with hard edges. 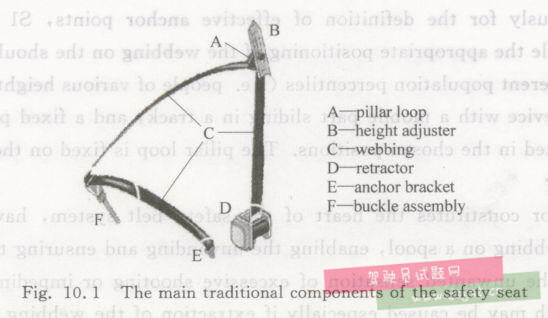 In practice the pillar loop is the effective upper anchor point which can either be fixed,if anchored directly to the central pillar, or mobile in terms of height with the seat beltsheight adjuster. The most common implementation uses a metal ring covered with an in-moulded plastic material. Although this component appears to be quite simple，it is critical in terms of thestresses that must be endured and damage to the webbing that could result. For thisreason, the pillar loop is designed to resist impulsive loads，and prevent the webbingrunning through it very quickly during the impact or becoming twisted over its widthwhich may cause significant abrasion and result in breakage of the webbing. The buckle is the component of the seat belt to which the tongue is engaged, madewith plastic material in-moulded on a metal insert similar to the pillar loop. The buckle assembly is composed of a coupler contained in a plastic casing equippedwith a release button which must ensure release operation, particularly following anaccidents and provide a link to the real anchor point. Today, as already mentioned, thereal anchor point is placed on the seat, whereas in the past it was located on the floor; thelink can be made with a metal cable or flat metal. This device is installed on the central pillar（B pillar)，according to the proceduredescribed previously for the definition of effective anchor points, S1 and S2，and isdesigned to enable the appropriate positioning of the webbing on the shoulder of occupant，according to different population percentiles (i. e. people of various heights). It comprisesa slide-shaped device with a mobile part sliding in a track, and a fixed part to which thecursor can be fixed in the chosen positions. The pillar loop is fixed on the cursor. The retractor constitutes the heart of the safety belt system，having the task ofwrapping the webbing on a spool，enabling the unwinding and ensuring that the seat beltdoes not cause the unwanted sensation of excessive shooting or impediment to occupantmovement，which may be caused especially if extraction of the webbing is blocked whennot required to do so. Instead the locking of the webbing is standardized by the regulation R 16 and isgoverned by two independent systems: the geometric and dynamic system. The geometric system causes the locking of the belt when, due to external events(deceleration, shock, etc.），the car moves by a significant number of degrees compared tothe reference horizontal position. To retain vehicle occupants with safety belts without penalizing the comfort or createsecondary injuries is a relatively complex task; the load limiter represents a valuable aid toreach the goal，thanks to the use of the pretensioners，by now almost standard, which areanalyzed below. The load limiter, nowadays practically an integral part of the retractor, has the taskof limiting the force transmitted by the belt to the shoulder and the chest during animpact，so as to mitigate any effect on the occupants. Part of the load limiter is the torsionbar，located in the retractor. During impact, it twists around, enabling a limited andcontrolled unwinding of the webbing so as to limit the force exerted on the occupant andthereby mitigating damage to the shoulder and chest. Seat belts are designed for adults and larger children. Small children must be properlyrestrained in child safety seats. A pregnant woman needs to wear a seat belt to protectherself and her unborn child.